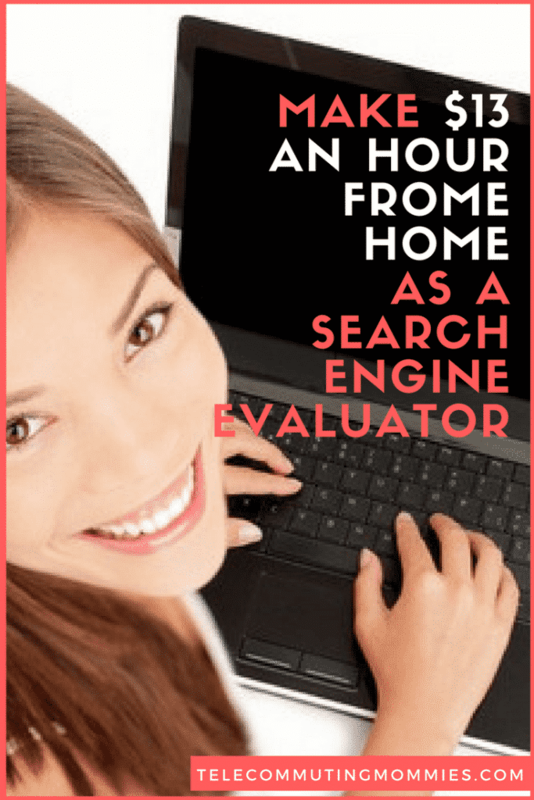 Search engine evaluator jobs are a great option for many stay-at-home moms looking for a work from home job. For other similar opportunities visit the Google work from home page for other ways you can make money from home with Google. If you have been looking for a work from home position but struggle to find something that is a non-phone job and is flexible then you may be interested in these types of positions. These search engine evaluator jobs are usually a great fit for stay at home parents that want to work from home but need something that offers a flexible schedule. It is also a great fit for college students that want something flexible or those who might be trying to work a second job to earn additional income. What are Search Engine Evaluator jobs? The basics of search engine evaluator jobs are to evaluate search engine results as to how relevant they are. When you type a search into Google, or any other search engine, you want the results to come back to be as relevant as possible to help you find what you are looking for. This is one of many ways that search engines use to make sure their search engine results are accurate. While you may think that this process is completely automated, there are certain aspects that require a human element. As a search engine evaluator you are given a search term and then an assortment of search engine results and are asked to rank them based on how relevant the results are and the quality of the results. The problem with trying to do this completely automated is that sometimes a search engine result may have all of the terms in the user’s search but really is not relevant. For example, if a search engine user typed into Google the term “cinnamon apple yogurt” they would get a list of results that include a lot of recipes for cinnamon apple yogurt which is most likely what that user is looking for based on the search. But the user might also get things like “Yogurt Apple Cinnamon Bread”and “Cinnamon Apple Yogurt Scones”. I did this search on my own just to come up with some examples but I am sure you can think of your own examples as well. These types of search results are fine as long as they are further down the list, not on page one. But as you can see they have all the necessary terms that the user searched so when search results get sorted purely by computers you don’t have this human element to think “Well yeah that has all the search terms but is probably not what the user is looking for.” That is where the human element comes into play. How Do You Get Hired For Search Engine Evaluator Jobs? You need to be fairly experienced on basic computer skills and internet research skills but this isn’t anything that would be beyond the average person’s abilities if they use a computer frequently. Besides that, you need your own computer and high speed internet. Before getting hired you must pass a test but are given very extensive study materials that help with this. Many of these companies hire internationally so you can work from anywhere in the world if they have positions available. The companies are looking for people that use the internet regularly and you have to go through their training materials and pass a test to prove you understand the rating systems. You must own your own computer and have access to high speed internet. What Are Search Engine Evaluator Jobs Like? The great thing about this position is that there is no phone work involved and it is one of the most flexible work from home jobs out there. The system that you work through with each company is available 24 hours a day so you can work early in the morning, during nap times, late at night, or whatever works for your specific schedule. Search engine evaluators are simply given a search term and then given possible search results and evaluators are asked to sort them based on best to worst. Again, details on how the rating system works is provided in training materials and you will be tested on this material before being hired. You also don’t have to let them know when you will be available like with many work from home companies. If you find you have some free time, hop on and start working. Some of the companies do require a commitment to meeting a minimum number of hours per month but it is fairly minimal and with the ability to work whenever you want, it should be easy to reach. Pay ranges from around $13-15 an hour. What Companies Hire For Search Engine Evaluator Jobs? Really all of the companies that hire for these types of positions are working through Google as third parties but there are several companies that do the hiring and I have heard good feedback on all of them. If you need a way to bring in some extra income but do not have the time to work a full-time work from home job or need something flexible to work around your schedule, then search engine evaluator jobs might be the perfect fit for you. As always, any feedback on these companies from those that have worked for them is welcome.